As always, the recipes below are my edited versions. The links send you to the original. In a blender, combine shallot, garlic, ginger, lemon juice, soy sauce, sugar, and vinegar. Process until smooth. Serve at room temperature. My favorite was the vinaigrette. They liked both. 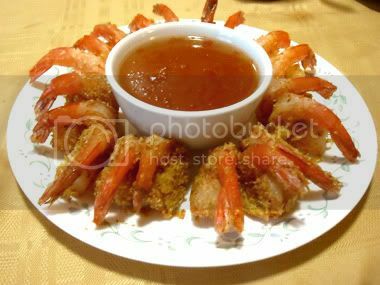 While they were enjoying the salad course, I worked on frying the Coconut Fried Shrimp to serve with homemade Sweet and Sour Sauce. Baby Aladdin munched on baked goldfish. Shell and devein shrimp, leaving tail intact; dry well. Combine flour, sugar, salt, egg, ice water, and vegetable oil; beat until smooth. Mix together coconut and curry powder. Dip shrimp into batter then into coconut mixture. Fry coconut shrimp in hot fat, about 370° until golden. Coconut shrimp serves 4 to 6. Place the sugar, vinegar, water, soy sauce, and ketchup in a medium saucepan, and bring to a boil. Mix cornstarch with a bit of cold water until fully dissolved, then add to the mixture. Stir continuously until the mixture has thickened. This was my personal favorite all night. Erik nearly inhaled the entire platter. Zareena and I were able to rescue a combined 4 shrimp for ourselves. 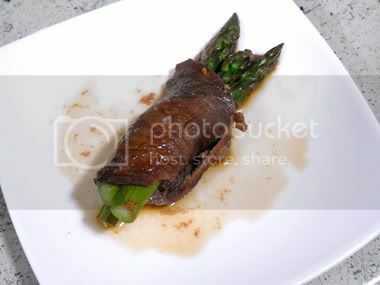 The main course was supposed to be lightly broiled Asparagus Beef Rollups. Marinate the steaks in the bag for at least 2 hours in the refrigerator. Preheat oven to 400°F. Bring a large saucepan of water to boil. Add asparagus to boiling water and boil for 1 minute to blanch. Remove asparagus and set aside to cool. Slice marinaded steak into 12 equal-sized strips. Take 2 to 4 pieces of asparagus and lay together at one end of a beef strip. Roll up and place seam side down in a glass baking dish. Repeat for remaining 11 beef strips. Bake in oven for 7 minutes. Turn oven up to broil and place baking sheet under broiler for 3 minutes. Serve immediately. Spoon pan juices over roll ups. I made the mistake of forgetting these in the oven! They cooked for 20 minutes under the high heat. The meat wasn't too bad, if you like it well-done with a bit of a char. The end piece for the night had little to do with Asia, but made up of two of my favorite things: scotch and cheese. I'd found this fondue recipe by accident via Imbibe the week before, and decided it had to be part of the menu. In a 2-quart saucepan over medium heat, melt the butter and sauté the onion until soft, about five minutes. Add the milk and heat until bubbles form. 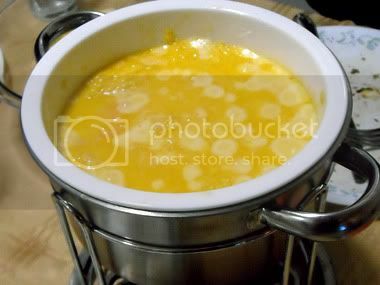 Gradually add the cheese, a handful at a time, stirring each time until the cheese is completely melted. In a small bowl, blend together the cornstarch and whiskey; stir into the cheese mixture and cook until blended, two to three minutes. Salt to taste. Transfer to a fondue pot and keep warm over low heat. Serve with bowls of bread cubes and sliced apples and baby carrots. The milk curds separated out (which was unattractive). Except I didn't realize that at the time, I just thought the cheese wasn't melting. Now I know better. By the time we finally got to the fondue, we were so full we didn't even finish it. But it was so good, we kept trying to force more down our gullets. We capped off the night with a couple glasses of almond champagne from Wilson Creek in Temecula, CA. There's nothing Asian about that either, but it was bubbly, so who cares? Baby Aladdin and I then made pirate hats out of construction paper. Because we're pirates! I was completely satisfied with the shrimp and sweet and sour sauce. But it was an amibitious menu. Next time, I'll keep it to 2 dishes. And the fondue deserves another go around. I know I can make that better.